SCVHistory.com LW3248 | Film-Arts | Jack Lord Stars as 'Stoney Burke' (ABC 1962-63) with Bruce Dern. 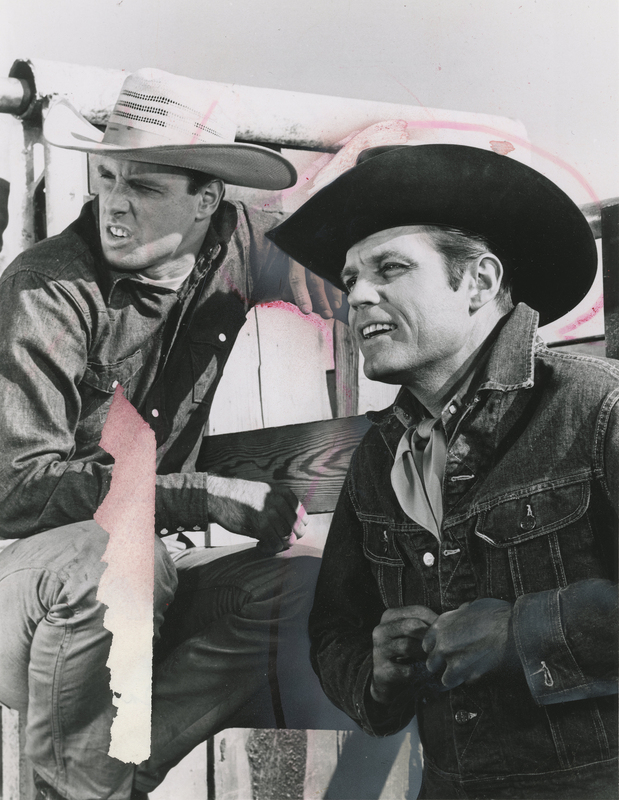 Jack Lord Stars as "Stoney Burke"
Jack Lord, right, of (later) "Hawaii Five-O" fame, plays the title role in "Stoney Burke" a one-season ABC television series (1962-1963) that was based at Bonelli Stadium (Saugus Speedway) when it still hosted an annual rodeo. Bruce Dern, left, was one of four regulars. Dern appeared in half of the episodes (17), while Warren Oates, Robert Dowdell and Bill Hart (no relation to the man with the mansion) appeared in all 32. 6.5x8.5 publicity photo accompanied Bob Thomas's syndicated Associated Press feature on Jack Lord (below) in some newspapers. This print is from an unknown newspaper archive and is marked up for publication on Sunday, February 17, 1963. As published in the Asbury Park (N.J.) Press | February 9, 1963. Hollywood (AP) — The casual visitor would scarcely expect to see books of Renoir and Van Gogh in the dressing room of Jack Lord, rugged star of the rodeo series, "Stoney Burke." But they are there. I'll tell you something else about Lord: Five of his art works are owned by the Metropolitan Museum in New York. He is not the kind of guy you would expect as star of an action series. He's rugged, yes. Also a rugged individualist. Art came first for the handsome New Yorker. As John Joseph Patrick Ryan, he was chosen the best high school art student of the year; got his degree in art at New York University. He had a couple of starvation years in the garret, then gave it up. He was hailed to Washington to illustrate a book for the Maritime Service — he had been to sea for five years, earned a mate's commission. He took part in some training films, found he liked acting. Back in New York he talked himself into Sandy Meisner's dramatic class and sold Cadillacs by day. "I was earning $18,000 a year when I quit," he said. "They thought I was nuts. I was being groomed as one of the top salesmen in the company, but it didn't matter to me. I told them I was quitting because I had to do what I had to do." Another lean period. But Ralph Bellamy gave him a role on his television series on the basis of the training films. He started clicking in TV plays ("Cat on a Hot Tin Roof") and films ("God's Little Acre"). "I did about eight pictures and somehow got typed as a heavy," he said. "Type casting is a vicious thing out here, and I was determined to break it. For eight months I didn't work. I changed agents three times and I never could convince them that I was serious about not doing heavies." Lord ("It's a family name I took because John J. Ryan sounded like a retired police commissioner") also turned down 20 television series, including "Ben Casey" and "Wagon Train." Then along came "Stoney Burke," a hard-hitting, well produced hour about life on the rodeo circuit. Lord liked the upbeat nature of the role and the devotion to story values of the producer, playwright Leslie Stevens ("Marriage-Go-Round"). Lord does all his own stunting except coming out the chute — "That would be suicide for the series." The ABC series has managed a respectable rating against the CBS Monday night powerhouse (Lucy-Danny-Andy) and prospects look bright for a second season. "The power of television," he muses. "After only 15 weeks on the air, I've got three pictures I can do during the summer holiday. And none of the roles is a heavy." LW3248: 9600 dpi jpeg from original photograph purchased 2018 by Leon Worden.